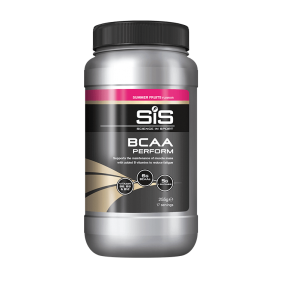 Beta Alanine is the latest addition to the Science in Sport range, offering a convenient way to help increase physical performance. The product contains 100% pure Beta Alanine which has been shown in many scientific studies to help delay the onset of fatigue during short bouts of high intensity exercise. Each serving contains 1.6g of Beta Alanine. Beta Alanine is a naturally occurring, non-essential beta amino acid. Beta Alanine combines with muscle L-histidine, helping to increase muscle carnosine stores. Often, Beta Alanine is the limiting factor of low muscle carnosine stores. Beta Alanine is a commonly used supplement among explosive sports and some endurance events. A daily intake of 3.2g Beta Alanine has been shown to help decrease the onset of fatigue during high intensity exercise lasting 1-4 minutes. Beta Alanine is tested under the Informed Sport Certification program. This approach involves testing every single batch of our finished product which leaves the Company’s factory, screened against the 2017 World Anti-Doping Agency (WADA) list. Banned substances including steroids are tested to the level of 10 Nanograms per gram, and stimulants to 100 Nanograms per gram. Batches (sampled at the beginning, during and end of each product batch) receive the recognised and respected Informed Sport* certificate and Science in Sport provides the documentation to athletes on request. Take 2 tablets, twice per day. Ideally, take around 30 minutes pre-workout. Carnosine is synthesized in skeletal muscle from L-histidine and Beta Alanine- amino acids. Elevated muscle carnosine levels have been associated with increased tolerance to muscular fatigue during exercise. Supplementation with beta alanine has been shown to increase muscle carnosine content and therefore total muscle buffering capacity, with the potential to improve physical performance during high-intensity exercise. Studies on beta alanine supplementation and exercise performance have demonstrated improvements in performance during multiple bouts of high-intensity exercise and in single bouts of exercise lasting more than 60 seconds. Aim to consume 3.2g of Beta Alanine per day, 2 tablets, twice per day. I’m an endurance athlete, will Beta Alanine help me?